As promised, the “Signs of Success” podcast has officially arrived! 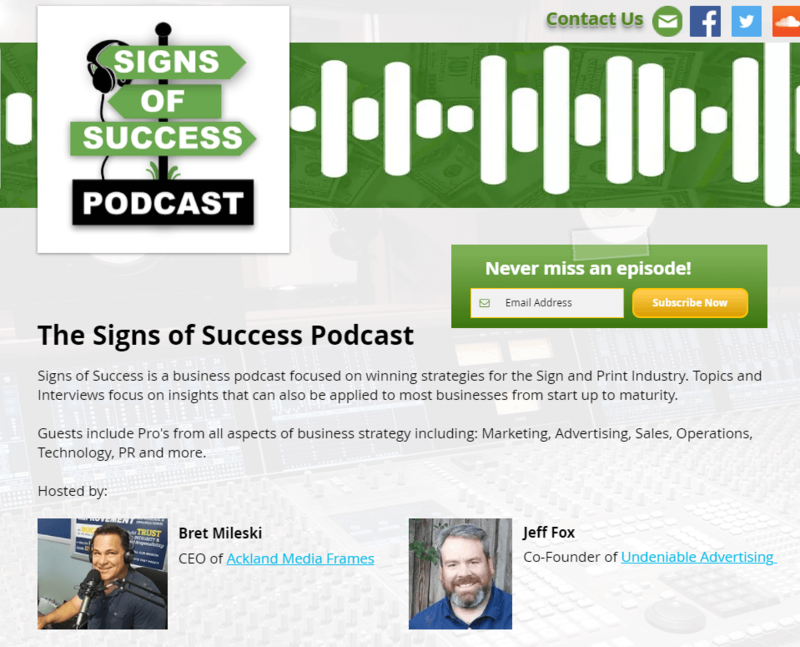 The Signs of Success is a business podcast focused on winning strategies for the Signage/Print Industry, but with topics and interviews focused on insights and practical strategies that can be applied today, to almost ALL businesses from start-up to maturity. Guests include business owners and entrepreneurs – – dynamic professionals who have spent their lives “in the trenches”. They’ve got expertise in all areas of strategy and development, including: Marketing, Advertising, Sales, Operations, Technology, Finance, PR and more! They’ve made it from the “boot strap” stage, all the way to 7 & 8 figure sales volumes, and they’ve taken notes along the way. They’ve got scars and stories from the school of hard knocks, and they’ll be passing on lessons you won’t want to miss. We’re super excited because we’ve got a lineup of guests that are going to help our listeners go out and get it done! Find more business. Close more sales, increase capacity, innovate, keep more of what they earn, and improve their quality of life. It’s been said that the road of “the entrepreneur is a lonely road”, because it’s tough to find mentors, people that have been where we want to go. The signs of success podcast is designed to bring you those mentors – and give us all a boost. What strategies and tactics worked well for you when you first got started? What do you wish you would’ve known back in the day, that would’ve saved you headaches and heartaches? What one piece of advice would you like to offer people who are branching out on their own for the first time? What is the best mistake you ever made, and why? In periods of your fastest growth, how did you sustain things, and keep your cash flow healthy? What one mindset has gained you the most business, out of everything you’ve ever done? We’ll be answering these questions and many more. You’ll hear great successes and miserable failures. Enjoy colorful stories, and maybe even cringe a little over some heartfelt truths. But most importantly, you’ll gain wisdom that you can stand on to reach the higher things in life. Here’s an excerpt from Episode 1: Wallscape-Billboard-Clip. Seriously. We understand how busy you are. And we understand that time is not only money, it’s also life. We respect that, and our only goal is to enhance your life, not create some meaningless distraction that takes even more of you away from what’s truly important. That’s why we’ll be carefully selecting our guests, and editing down our sessions to bring you the best, the extract, the nuggets, and the pearls of wisdom. Furthermore, we don’t just want to give you an entertaining listen. We want people to tell their stories, so you can hear what they did, and how they did it, and so you can put these techniques into practice right away. Lastly, we want your feedback. Putting out content of any kind can be arduous, and even grueling, at times. Let us know what you think. Help us do a great job, simply by posting notes and comments, or sending us feedback. Thanks in advance for listening, and creating your own “Signs of Success”. This entry was posted in Business Tips, Sales & Marketing and tagged ackland, advertising, billboard, blog, business, entrepreneurs, marketing, mentor, podcast, printing, sales, signs, success.